An Indian civil servant, SM Raju, has come up with a novel way of providing employment to millions of poor in the eastern state of Bihar. His campaign to encourage people to plant trees effectively addresses two burning issues of the world: global warming and shrinking job opportunities. 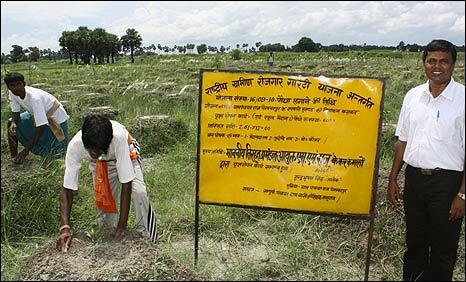 Evidence of Mr Raju's success could clearly be seen on 30 August, when he organised 300,000 villagers from over 7,500 villages in northern Bihar to engage in a mass tree planting ceremony. In doing so the agriculture graduate from Bangalore has provided "sustainable employment" to people living below the poverty line in Bihar. Mr Raju has linked his "social forestry" programme to the central government's National Rural Employment Guarantee Act (NREGA) which is also designed to provide employment to poor people. Under NREGA - initiated in February 2006 as the government's most ambitious employment generation scheme for poor people - the authorities are bound by law to provide a minimum of 100 days of employment a year to members of families living below the poverty line. About 44% of Bihar's population fall into this category. "The scheme has brought benefits to thousands of families since its implementation," said a recent International Labour Organisation report. But Mr Raju says that Bihar - being the poorest and most lawless state of India - has not been able to spend the allocated NREGA funds. "This is because of a lack of awareness among officials about the scheme," he said. The poor monsoon this year has led to lower agricultural outputs, while flash floods in some northern districts has made the situation even worse, he said. "So the idea struck to my mind, why not involve families below the poverty line in social forestry and give them employment under this scheme for 100 days? "Under the scheme, each family can earn a minimum of 10,200 rupees ($210)." The civil servant immediately made a blueprint of his idea and got the support of senior state officials. In June Mr Raju released a comprehensive booklet of "dos and don'ts" and distributed it to village heads and district officials. His initiative meant that NREGA funds were fully utilised - in the past this has not always been the case. 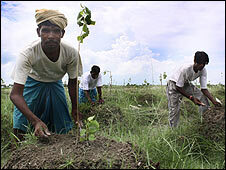 "I told the villagers that they would get 100 days employment in a year simply by planting trees and protecting them. The old, handicapped and widows would be given preference," he explained. Every village council has now been given a target of planting 50,000 saplings - a group of four families has to plant 200 seedlings and they must protect them for three years till the plants grow more sturdy. "They would get the full payment if they can ensure the survival of 90% of the plants under their care. For a 75-80% survival rate, they will be paid only half the wage. If the survival rate is less than 75%, the families in the group will be replaced," the guidelines say. Under NREGA rules, each worker has to be paid 100 rupees ($2) per day for 100 days in a year. 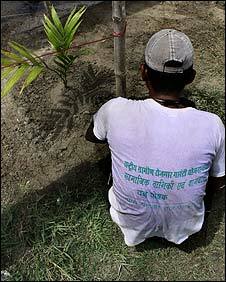 Mr Raju even came close to planting one billion saplings on a single day. "I started preparing for this and motivating villagers by announcing the date as 30 August," he said. "The target for every village panchayat (council) was to plant 6,000 saplings from 6am to 6pm to achieve the target of one billion. At the end of the day, we found out that we were just just short of the target, but it was still a world record," the beaming civil servant said. Significantly, his scheme has even stopped the migration of poor labourers from the area in search of employment elsewhere during monsoon time. "We never thought we would get employment for planting trees and protecting them," said Paigambarpur village head Indra Bhusan, whose community - like many others - planted over 30,000 saplings mostly on both flanks of the 14km embankment which criss-crosses their village. The saplings planted are both fruit and non-fruit trees. The non-fruit seedlings have been planted on the banks of the embankment and on state and national highways - while fruit bearing trees are planted inside the villages. This year the central government has given more money to the scheme. Meanwhile, the Bihar civil servant is busy collecting the facts and figures to get his feat listed by Guinness World Records. 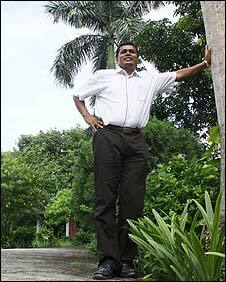 "Bihar has edged out Pakistan from the record book," he said flashing a confident smile. "Its all become possible due to villagers. I owe them a lot."